Claiming themselves to be the fastest-growing airline in the world, Qatar Airways is one of the youngest airlines serving all six continents. From Qatar’s home airport Hamad International Airport in Doha, State of Qatar, the popular Middle-East airline connects over 150 destinations every day. 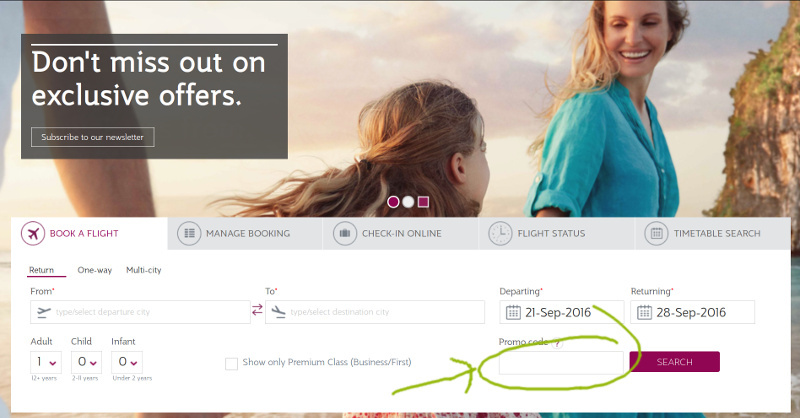 You can now save with special flight offers and promo codes when you book your flight online with Qatar Airways. Flying with Qatar Airways is a pleasant experience. I have booked with Qatar a couple of times, flying from Germany to Australia and the other way round. The whole customer experience from booking to check-in to Aircraft and Airport services outperforms customer experiences with most other airlines. Comfortable seats even in economy class, delicious food and beverages, a fantastic in-flight entertainment, but also professional Airport Services and Airline Lounge facilities are the reasons why Qatar Airways receives a 5 Star Airline Rating from Skytrax, operator of well-known air travel review site airlinequality.com. Qatar Airways is a highly awarded air travel service provider who has been voted Airline of the Year by Skytrax 2011, 2012, and 2015. More than 40,000 professionals work for Qatar Airways. The current fleet for public air travels consists of 170+ aircrafts. Amongst them are 6 Airbus A380-800, 34 Boing 777-300 and 15 Airbus A330-200. If you want to enjoy flying with one of the worlds exclusive five-star-airlines, booking online is the easiest option. Booking on qatarairways.com gives you a few advantages, e.g. Always check this page here first for the latest Qatar flight deals. 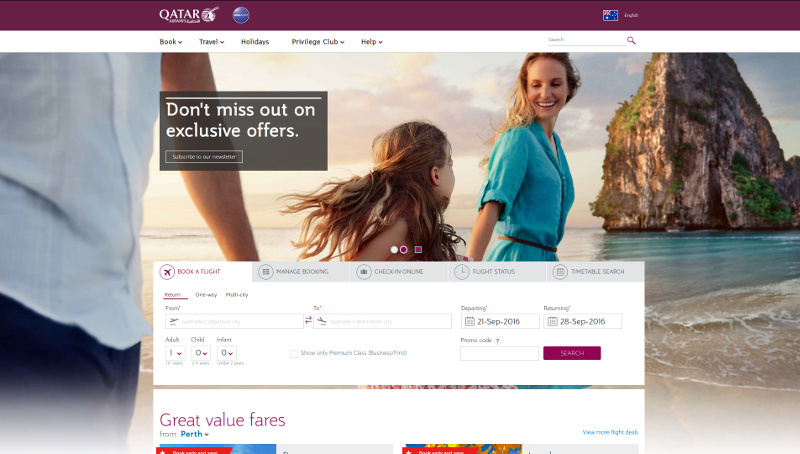 Click on any matching deal and get redirected straight to Qatar Airways booking website. There you will find a flight booking mask. Enter your travel details and search for available flights. Note: Enter any promo code you’ve found here right into the appropriate field labeled Promo code – before you hit the Search button! How to save with Qatar coupon codes? Qatar Airways frequently offers exclusive flight promotions and deals. If you have a promo code for Qatar Airways, you can redeem it on your next booking. However, make sure that you enter your code right in the beginning of your flight research and booking process. Later in the booking process, redeeming your promo code might not be possible anymore. See promo code input field in the picture below. Qatar Airways flights depart from Sydney, Melbourne, Perth and Adelaide plus they have connection flights from Brisbane via Sydney. Simply use our special promotion code when booking online to enjoy 10% off* your next Qatar Airways flight departing from Melbourne, Sydney, Adelaide, and Perth. Offer is valid until 30 April 2017, for travel from now until 31 March 2018. *The discount applies to base fare only and does not apply to taxes and all other standard market surcharges. See website for full terms and conditions. – Sales period – 2 March 2017 – 31 March 2017. – Travel period – 4 March 2017 – 31 December 2017. – Offer valid on Qatar Airways operated flights departing from Melbourne, Sydney, Adelaide, and Perth only. Enjoy a special discount on your next flight with Qatar Airways from Australia. Up to 10% off* your next Qatar Airways flight departing from Melbourne, Sydney, Adelaide, and Perth. Type in the destination you wish to travel to. Choose your departing and returning date. Type our promo code in the box promo code. – Travel period – 11 February 2017 – 31 December 2017. – Discount applies to the base fare only. – Discount does not apply to taxes, surcharges and all other standard market surcharges. – Some flights may not connect and so may not be available. Please review at time of booking. Up to 10% off your next flight! Hurry up!